IF YOU CAN ADD IT TO YOUR SHOPPING CART, THEN IT IS IN STOCK. 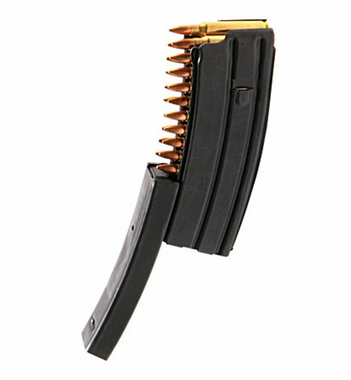 The CAMMENGA EM2-556 EASYMAG Magazine(NSN: 1005-01-573-6771) is a heat-treated steel magazine for your .223 or 5.56 caliber rounds, with tip-proof steel follower, chamfered feed lips, and a stainless steel main spring, which improves upon the reliability and feeding performance expectations for M16 and AR-15 type weapons. Built to last with high-strength 1050 spring-steel finished with a two layer anti-friction coating. The .223 EASYMAG magazine features an open case design that allows for fast loading, unloading, and cleaning. The front half can be unlocked and opened to facilitate rapid loading without the aid of a loading device. The EASYMAG magazine also accepts stripper clips and can be quickly cleaned without disassembly. Also works great with Bump fire! Heat-Treated 1050 Steel construction is highly resistant to deformation and maintains critical dimensions. This increases the EASYMAG’s service life, feeding performance, and reliability compared to any similar magazine designs. Continuous curve geometry design provides optimal feeding performance and dramatically reduces the likelihood of malfunctions in battlefield environments. Slide-open design allows for rapid magazine loading, unloading, cleaning, maintenance, and inspection without disassembly. Accepts standard 10 round stripper clips, spoons, and other loading devices. Loading .223 or 5.56 rounds into your magazine has never been easier. Wanna see how the EasyMag works? Watch this AMAZING video (below) showing off the Cammenga EasyMag Magazine. Note: Video is of the 30-Round magazine (also available). Dimensions: 2.86" x 0.93" x 5.63"
Note: This Cammenga EasyMag magazine clip is an ITAR regulated item and will not ship overseas. Furthermore, this item is restricted in the following states: CA, CO, DC, IL, HI, MA, MD, NJ or NY. It is the customer's responsibility to be aware of and abide by all applicable local laws. SEE ALL THE CAMMENGA GEAR.